The 7MSN Ranch: Saturday encore ~ Now who's out of cone-trol? Saturday encore ~ Now who's out of cone-trol? I've spent alot of time at Morning Bray Farm lately, meeting and greeting everyone's new favorite donkey, Patrick. While I was there, Justina expressed her concern over Fergus' teeth, which just didn't look right to her. I looked at them...the vet looked at them...but that didn't stop Justina from worrying. So this encore presentation is for you, Justina. (p.s. 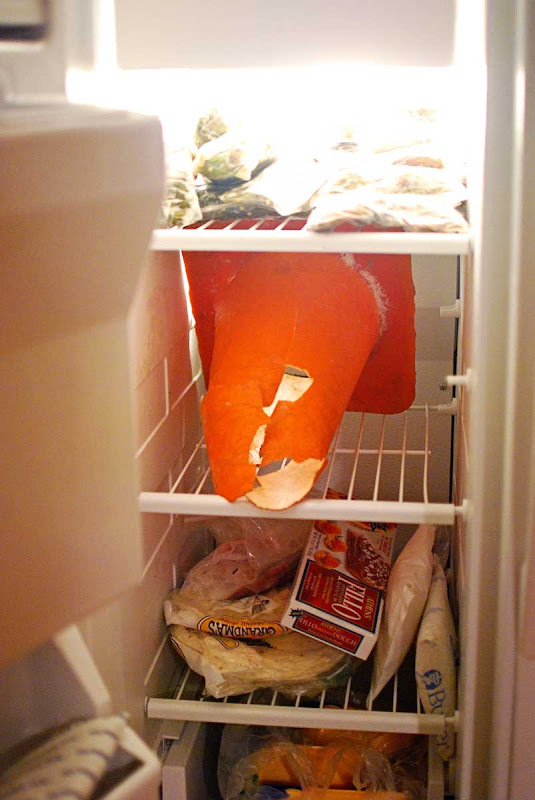 you might want to make a little room in your freezer). When I wrote yesterday that George and Alan were out of cone-trol, I wasn't kidding. 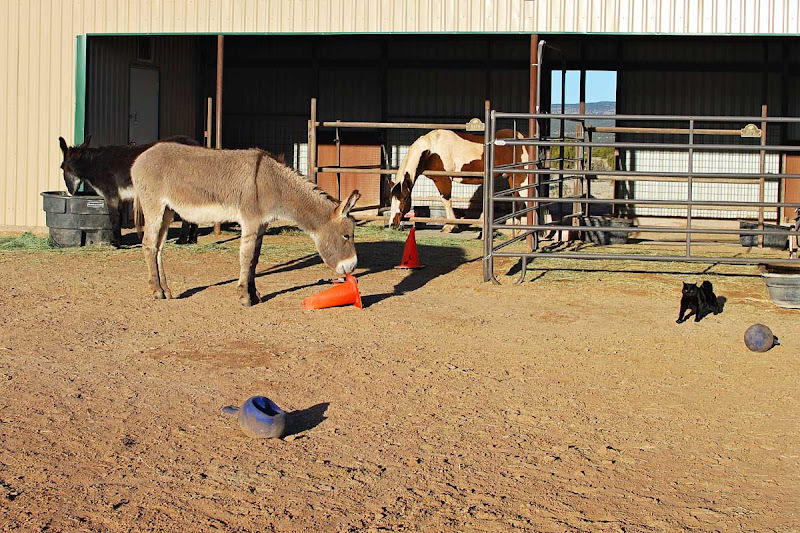 I have hundreds of burros-with-cone pictures in my camera from the past few days because that's all they seem to do lately. 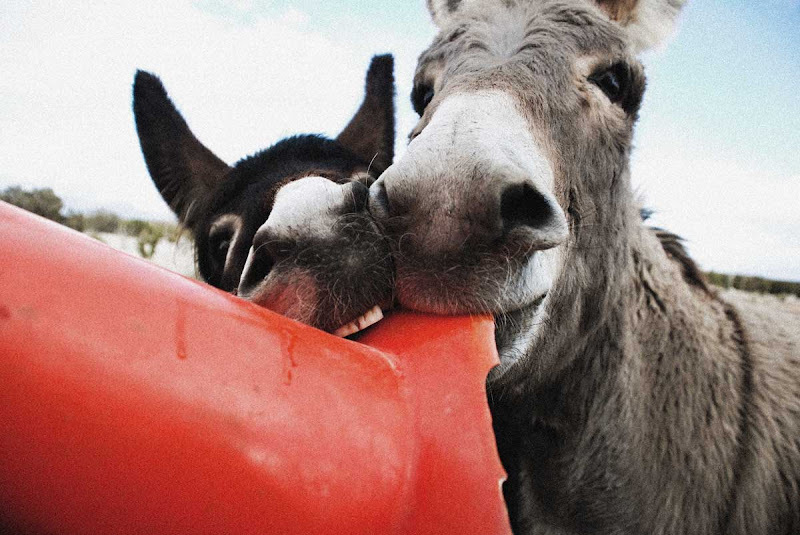 Really, how many pictures of burros with cones in their mouths can I post before you forsake me for...well, for wherever blog-readers go when they're tired of looking at burros with cones in their mouths? But a strange thing happened Monday morning. I looked out the window while the boys were eating their breakfast to see George eating a cone instead of his hay. I also saw no fewer than six cones and two jolly balls. So for those of you who asked yesterday if George and Alan had more than one cone to play with, rest assured their toy box is full. Anyway, I kept watching, and Alan kept eating his hay, Hank kept eating his hay, and George kept gnawing on a cone. That's not right, I thought, growing more cone-cerned by the minute. Then it dawned on me. I put down my coffee and went out to the barn. I haltered George and proceeded to examine his teeth. Sure enough, a pair of adult teeth were erupting. He'd been using the cone as a teething ring! George was none too happy about having my fingers in his mouth, but Alan was more than willing to cooperate and show the folks at home what all the fuss is about. 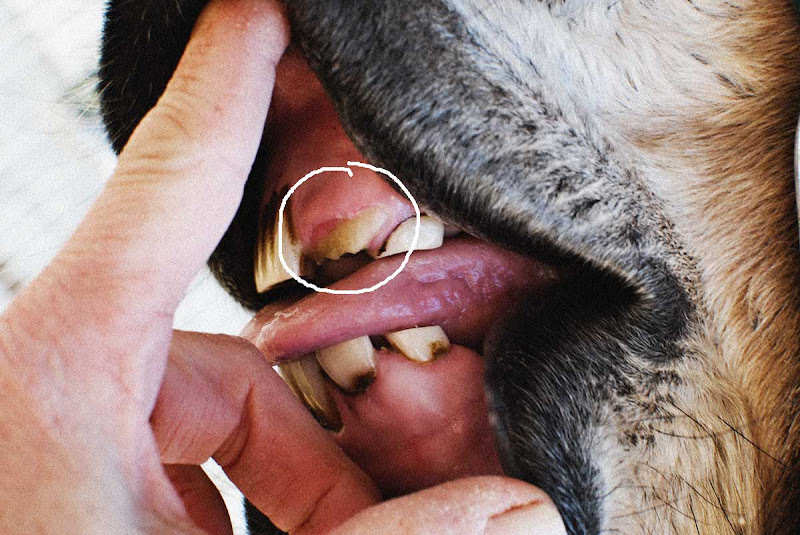 George and Alan are both about three and a half years old, and each of them has a pair of adult teeth coming in. So I'm pretty sure this explains the current cone-gnawing obsession. I happened to mention my cone theory to Bernard and Ellsworth's mom later in the day. She jokingly asked me if I was going to put their new teething ring in the freezer. I laughed. 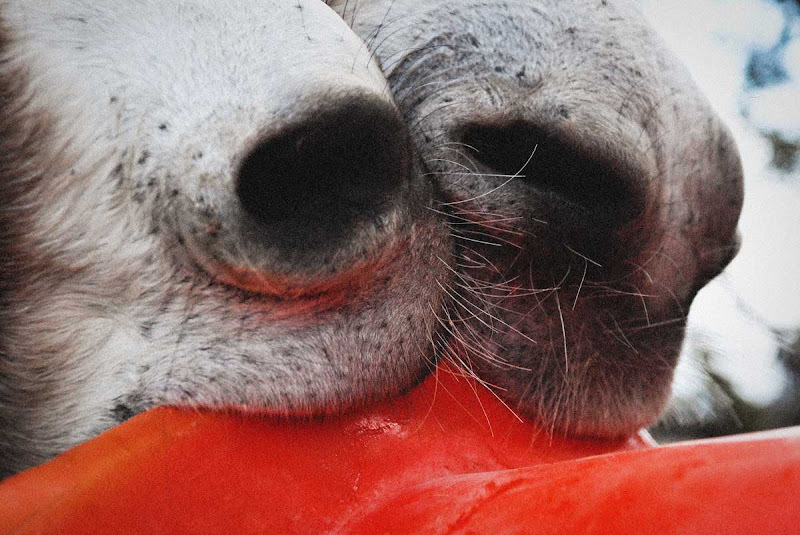 Until I started thinking about how a frozen treat might feel pretty good to a burro with sore gums. There isn't anything I wouldn't do for my boys. When I saw your title, I figured one of the Donks was going in. Great problem solving! My favourite is the cone with two sets of noses attached. LOL - Love the freezer picture. Poor guy... so did he like his frozen treat? Hope Fegus gets some relief too. Oh - and no I won't get bored with burros with cones in their mouths...I don't have a burro, so I have to cyberly enjoy your and Morning Bray and the Critter Farm. Love you all. You are such a good donkey mom!! Do you think he would chew on an ice block? Realize it wouldn't last very long in your temps but something I would try. 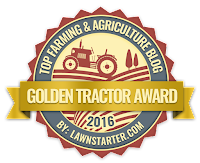 BTW, love the blog and look forward to reading it every morning. I wondered from your description if it wasn't teething. It's hard sometimes to keep track of who should be popping in new ones when, but sooner or later they tell when something's amiss. Sorry, I can't help but ask, did you sterilize that thing first? All I can think of is where the cones have been at my place. I think I'd be throwing mine into the creek for a cool down. That sucker feels near freezing. Deets! Thanks Carson! I bet that frozen cone felt good on poor George's gums. I saw a trio in Santo, TX that reminded me of your gang. A brown donkey, a gray donkey and a chestnut horse with a black mane. They were happily grazing in their pasture. I need to email you and Justina the pics I took with Justina's telephoto lens of the two of you examining Fergus' mouth. They are really quite awesome. I was thoroughly enjoying the cone tale until I noticed the black cat on the right. Is that Deets? Great idea about the frozen cone. Dairy Queen would be proud!